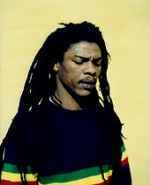 South African reggae vocalist, born on 12th August 1974 in Gugulethu, near Cape Town. Young Zolile's early steps into music began by singing in various church choirs. Spending his childhood years in the dusty township streets throwing stones at the police force, he eventually got himself shot by an officer in 1989, leaving him paralysed from the waist down. Upon recovery and through his faith in Jah, he began his ragga and dancehall career and formed the three-piece Chronic Clan group in 1994, subsequently winning several competitions and awards and establishing a solid local vocal presence in the Western Cape. Moving to Malmö, Sweden in August 2003, Zoro recorded and performed in Scandinavia for some three years. His first solo album, "Gugs News", was released by Juju Records in 2006, with some songs in his native isiXhosa language -- and a Jamaican accent!